Fear and loathing in boomtown. 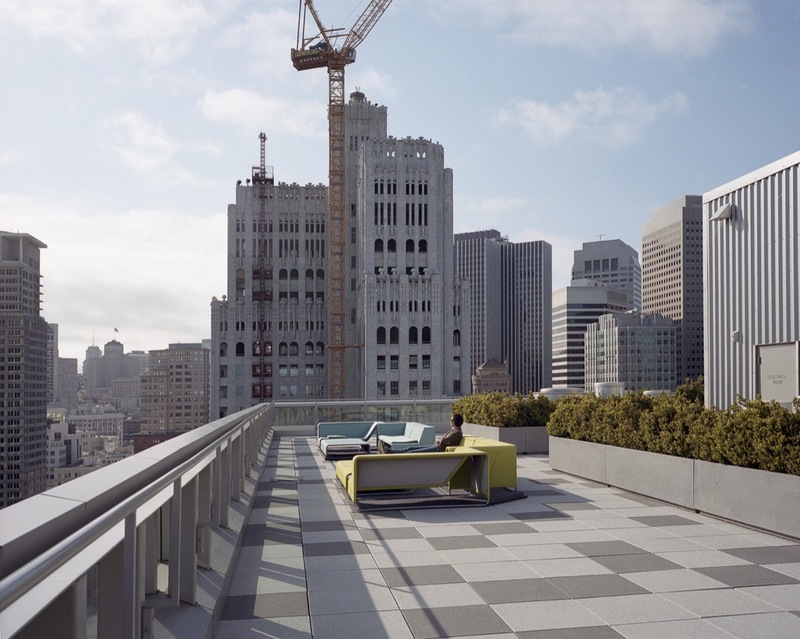 Janet Delaney, Roof Terrace One Hawthorne 645 Howard Street, 2013. When I tell pretty much anyone outside the tech industry I work at a start-up, there’s usually a pause. I can watch her compose her face, waiting to hear the worst. If I’m lucky, I’ll field questions about foie gras burgers, daily massages, or what it’s like to work with a bunch of clueless bros. I laugh, but I’m careful to say it’s not always like that. Sure, some places are beautifully designed and full of crazy start-up perks, but there are companies that aren’t. Like the one run by people I know, people who spent a year crammed in a tiny two-room office, busy around the clock, emails and messages flying at all hours. In fact, they’ve been going nonstop for a few years now, working on a product they hope will help people be smarter, safer drivers—and maybe even get people to use less gas. I know those people because they’re my coworkers. I was employee number fifteen. We’ve grown to nearly forty people, and once again we’re working in a space we’ve outgrown. We are a tech start-up, funded by incubators and venture capitalists you’ve probably heard of. We make a lovely piece of hardware. We also make a very cool app—and we hope what we make will fundamentally better people’s everyday lives. I like to think I am in the tech industry but not of it. One foot in and one definitely out. I have a wonderful job, one that challenges me, with people I think are smart and hardworking and lovely. I work on a product I think is legitimately interesting. I have health insurance through Kaiser and can afford part of a mortgage. I am glad to have these things, especially after the soul-sucking experience of unemployment. Yes, getting a job can be hard here in the Bay Area, if you’re not a developer. The first time I worked for a start-up was in 1996. I was fresh out of UC Berkeley with a degree in comparative literature and a crippling fear that I had no discernible job skills. I took the first job that came my way, doing marketing at a start-up, and got laid off a year later. I made my way to another job, then was poached by a third, and by the time I got laid off again I was weeks away from what would be a decade in graduate school. By the time I emerged with two master’s degrees and a Ph.D., it was all happening again. But it was different this time around. As much as I can, I keep “the industry” at a distance. Life outside the bubble gives me a good perspective on my work, and it’s where I feel most at home. My friends are writers, editors, small business owners, freelancers, engineers, designers, and lawyers. They don’t see me as a “tech person” or a “techie.” I don’t see myself that way either. But no matter what my friends may think of me, the polarizing forces of pro-tech and anti-tech in San Francisco are very real. People post fliers and wear T-shirts that say “DIE TECHIE SCUM,” and photos of these frequently make the rounds on Twitter and Facebook. When I see these and hear the “Die Techie Scum” anger, sometimes I laugh along with everyone. But sometimes it can be weird. Not because I think it’s directed at me personally, but because it’s a landscape I have to navigate thoughtfully. Is everyone in tech scum? Are all scumbags tech people? No, obviously not. So where, what, who needs to change? San Francisco has always been a boom and bust town, a place for fortune seekers and entrepreneurs, for those who wish to reinvent themselves. A city defined both by industry and by the wild, wooly power of its people. This isn’t the first wave of change to hit the city, but that doesn’t make it any easier. The current industry that holds San Francisco in its sway is one that regularly mints millionaires and billionaires. It breeds a class of people who feel entitled to high salaries and incredible perks, which feeds into rising inequality across the Bay Area. Like previous industries and their associated boom times, there is no doubt that the tech industry is complicit in the wrenching changes taking place in San Francisco and around the Bay Area. But what about those of us who work in the industry? What is our responsibility? Is it enough to educate from within? One night I got into a fight at happy hour with a tall guy, a serial entrepreneur who eagerly discussed the goings on at his newest start-up. He was the embodiment of Silicon Valley stereotypes, who everyone probably imagines when they think “Die Techie Scum.” He told me there was no sexism and racism in tech, and if there were, it wasn’t his fault that 150 years ago people who looked like him behaved badly. I wanted to walk away, enjoy my drink, and not make a scene. But I couldn’t, because if I didn’t say something, who would? Entitlement, I think, is the heart of the matter. But I can shout it at every new bar in town and I know it’s not going to be enough. I like to think I’m not trying to have it both ways, to benefit from the industry while not being “one of them.” But am I? If I am, is it wrong? I think about what it would be like if I had a similar job in another industry, earning a good living and doing interesting work. Would I feel conflicted? Is it the fact that I work at a start-up? I am uneasy about being complicit in everything that seems to be dividing San Francisco and the Bay Area, putting everyone I know into warring camps. Janet Delaney, Sales Force Convention, Moscone Center, Howard Street, 2013. Then I think about how my work is part of my community too. I work with people I care about and value. Work is part of where I live, too, part of where my friends are, part of what home means to me. How can doing thoughtful, meaningful work in a city I love be a bad thing? Not everyone in this new tech wave is like the guy at happy hour or that group at the bar. But not everyone is like my coworkers and friends either. I hear the tone-deafness among those in the tech industry—the refusal to consider other perspectives and to learn from them, to consider maybe we’re changing the world in negative ways while we change it in positive too. I’ve heard incredible thoughtlessness from people in the tech industry in nearly every possible setting. But I’ve also heard and seen incredible thoughtfulness, as well as significant involvement in civic issues from people in tech. The conversation about what’s happening in San Francisco and the Bay Area has spiraled into a maelstrom of anger and frustration. It’s hard to talk about the good, the bad, and everything in between without emotions rising. There is denial in the industry, and plenty of it, but there’s also a desire to do better. Sometimes it’s hard to hear the quieter voices. Sometimes it’s hard to be quiet. Sometimes it’s important not to be. 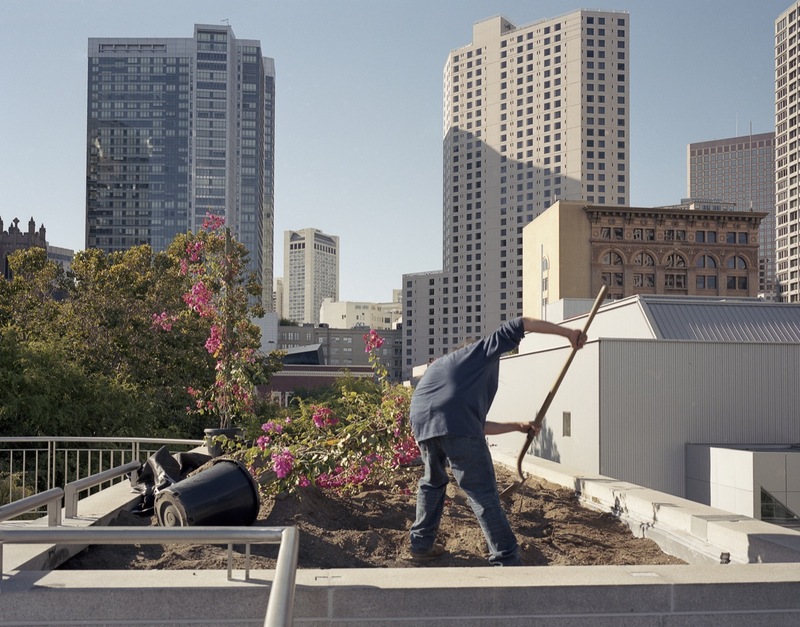 Janet Delaney, Planting Bouganvilla, Yerba Buena Gardens, 2013. Because look, we all want similar things: affordable property, safety, a chance to be a part of a community in a neighborhood we love. But what do these expectations mean? What about when they become entitlements? What does it mean to “discover” or “improve” a neighborhood, and for whom? Where do the evicted and displaced go? Where can they go? The fact is, buying a house in the Bay Area without a financial windfall or the generosity of parents who have saved over a lifetime is nearly impossible now. Renting is becoming unaffordable for many. In this market, with these policies, the saying goes: that’s just the way it is. Does it have to be? It hit me hard when a friend was evicted from her home. Other industries have changed the fabric of other cities, while creating unfathomable wealth for some and nothing but disruption for others. I know too that tone-deafness, obliviousness, and other forms of willful ignorance come in many forms and from many corners. Everywhere you go, in the tech industry and beyond, there are people who don’t, or can’t, see what’s right in front of them. These things are true, but I’m not trying to talk myself out of my own conflictedness. Maybe we should all take it personally when 116 families are evicted from their homes in San Francisco in a single year, when disabled seniors are suddenly turned out of apartments they’ve lived in for decades. Tech people like to say, “We’re changing the world!” How uneasy do we need to get before we think about how? Janet Delaney, Rincon Greens from 5th Street between Harrison and Bryant, 2014. But I don’t say this as a member of the tech community. I say this as a member of an actual community: the community I want to live in. 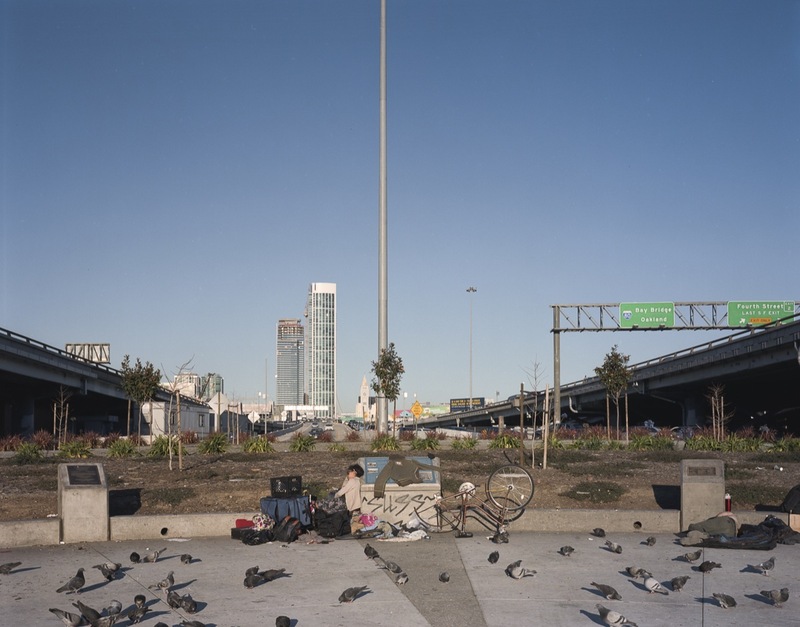 All photographs from Janet Delaney’s “SoMa Now” series, featured in the exhibition Now That You’re Gone. . .San Francisco Neighborhoods Without Us at SF City Hall, February 25 – May 23, 2014. 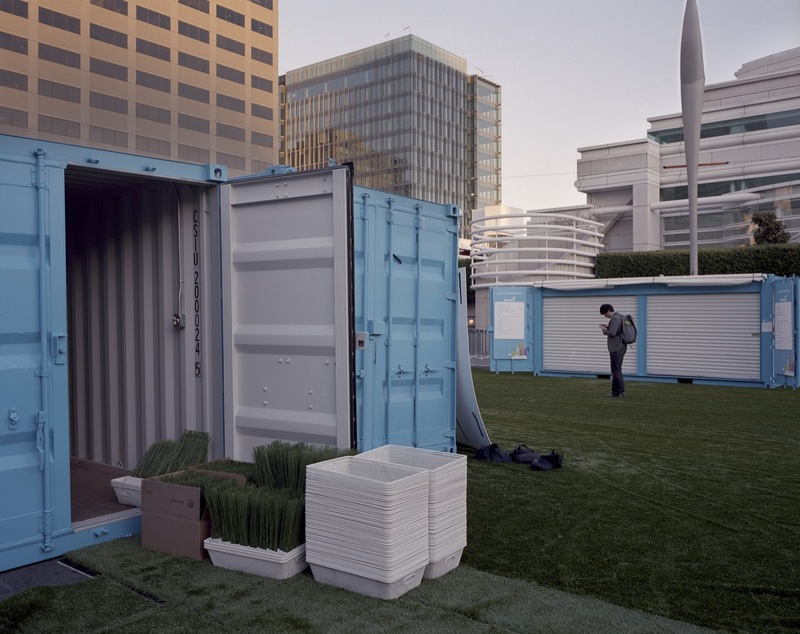 COURTESY OF THE SAN FRANCISCO ARTS COMMISSION GALLERIES AND JANET DELANEY.